With technology bringing construction costs down, land reclamation projects are increasingly attractive to real estate developers and investors in Malaysia. Turtle landings at nesting sites near land reclamation projects have plummeted. 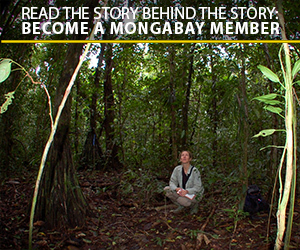 Traditional fishing communities also fear for their way of life. Environmental activists and coastal communities call for more detailed environmental impact assessments. 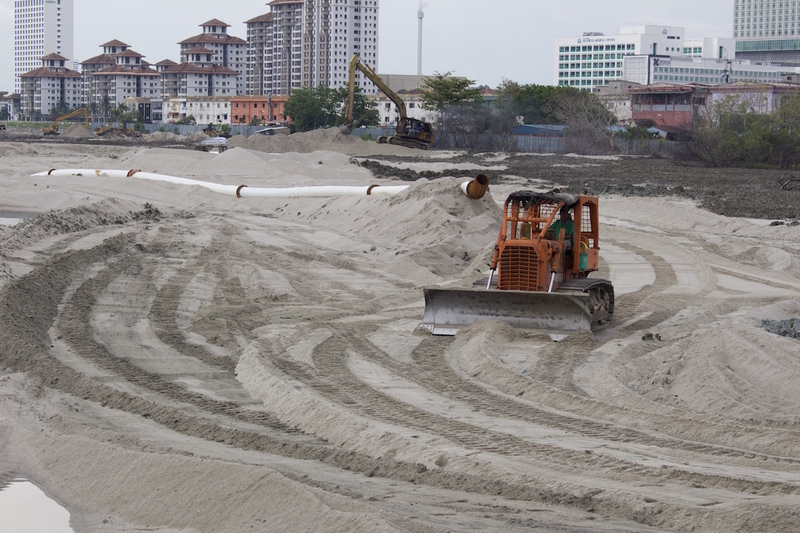 An excavator shifts sand between Pulau Melaka and the mainland. Photo by Kate Mayberry. Melaka – The expanse of sand stretches hundreds of meters in both directions, featureless and flat, its dusty monotony alleviated only by the excavators, trucks and dredgers that dump sand and rocks into the sea and smooth out the newly-created land. Billboards surrounding one site tout an aspirational dream of stylish apartments, luxury hotels and designer shopping malls. On the other side of the deserted highway that divides this artificial island, construction is already underway on an estate of extravagantly porticoed homes. “We’re standing in the middle of the sea,” remarks one of the guards at the security post. Over the past 20 years, reclamation has gobbled up swaths of ocean along Malaysia’s western coast, creating a man-made landscape of homes, offices, deep sea ports and cruise ship terminals. The state of Melaka, with its historic city overlooking the Strait of Malacca, began reclamation in 1974, but the process has gathered pace over the past two decades and a slew of recent projects have deepened concern about the environmental cost. 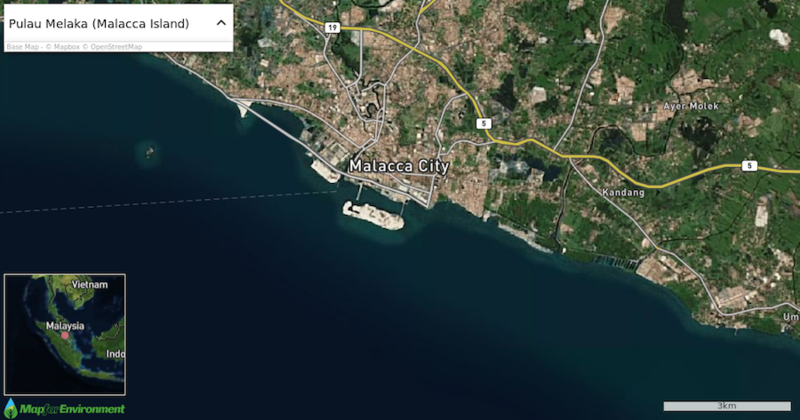 This satellite image shows Pulau Melaka, an artificial island in the Strait of Malacca. Little Pulau Upeh lies to the north. The island of Pulau Upeh is only a few kilometres north of the UNESCO-listed city. For generations it has been the state’s major nesting site for the critically-endangered hawksbill turtle (Eretmochelys imbricata), but reclamation is encroaching. Once two kilometres out to sea, Pulau Upeh is now only 600 metres offshore. The effect on the turtle has been immense. From 111 landings in 2011, there were just 13 recorded as of October this year. WWF Malaysia has been monitoring hawksbill activities on the island for a decade, and is concerned not only about the population in Pulau Upeh, but all along the coast of Melaka where there are at least ten nesting beaches. After Sabah in Malaysian Borneo, Melaka has the most significant population of hawksbills in the country. The turtle hatchery at Padang Kemunting. Photo by Kate Mayberry. Advances in engineering, coupled with rising prices for land and a desire to avoid messy ownership disputes, are helping fuel a boom in reclamation across the region. China has a long history of coastal reclamation, and is now involved in some of the biggest projects in Malaysia, which wants to tap Chinese expertise in infrastructure engineering. Indonesia has triggered controversy with schemes in both Bali and Jakarta, while Singapore has built much of its prosperity on reclaimed land. 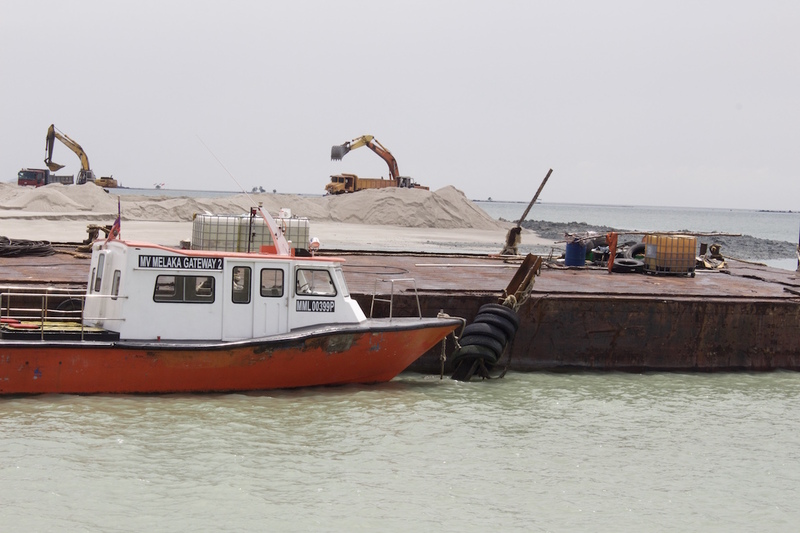 Chou Loke Ming, an adjunct research professor at the National University of Singapore’s Tropical Marine Science Institute says reclamation can have a widespread impact on the environment, from where the sand is dredged to where it’s dumped. 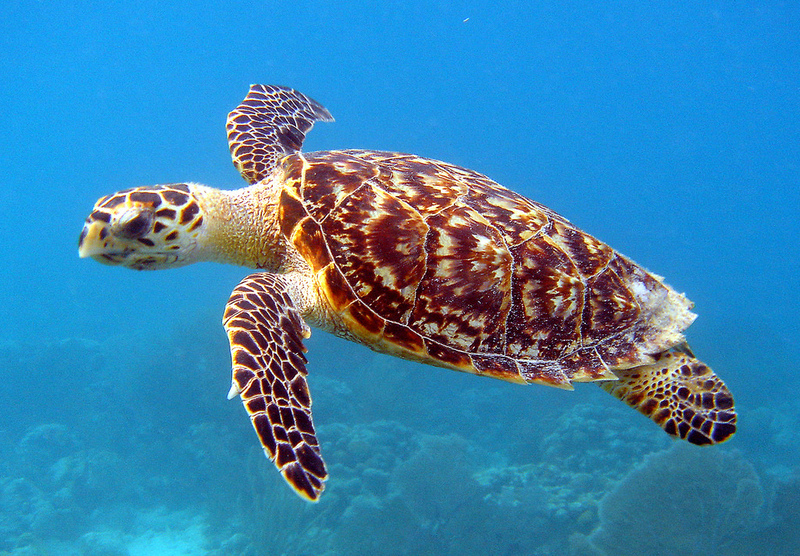 The hawksbill turtle. In the state of Melaka, landings of this Critically Endangered species have dropped dramatically this year. Photo by Gary Rinaldi/Flickr. Under Malaysian law, an Environmental Impact Assessment is mandatory for 19 types of activity, including land reclamation involving more than 50 hectares. Projects must also secure approval from the authorities at district and state level. In Melaka, a three volume Macro Environmental Impact Assessment (EIA) covering coastal land reclamation in the state was finished in 1998. The report, which is not available online and has been removed from the Department of Environment’s central library along with other reports completed prior to 2004, covered 19 proposed projects and 2,835 hectares of land. Idris Haron, the Chief Minister of Melaka, was travelling overseas and unavailable to talk to Mongabay about the state’s approach to reclamation. Given the scale of the new plans and the potential impact on coastal communities and vulnerable marine life, the WWF and affected communities have been calling for more detailed EIAs. Turtle landings across the state as a whole have fallen from 481 in 2013 to 367 at the end of October this year. 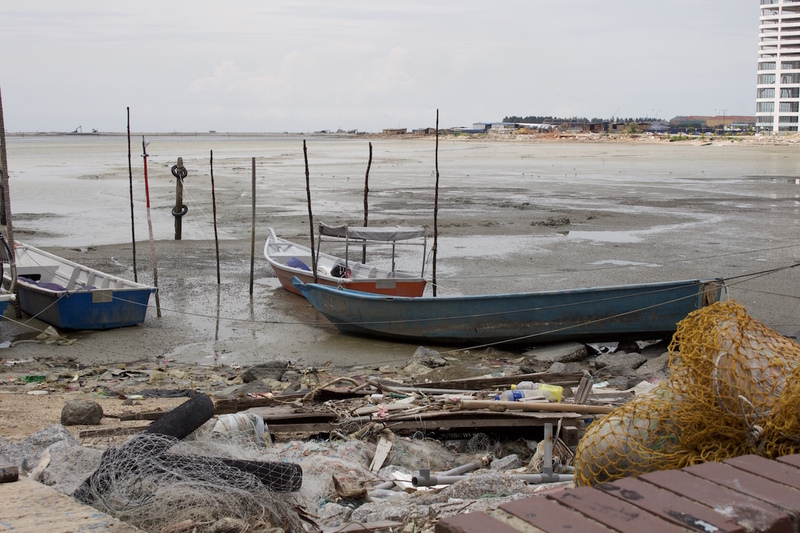 The same report pointed to the artificial island of Pulau Melaka as an example of the financial and environmental risks that come with reclamation. Built 20 years ago in the sea off Melaka Raya — the modern city’s commercial hub and itself on reclaimed land — Pulau Melaka’s original developers abandoned the project at the height of the Asian Financial Crisis in the late 1990s. Its streets and rows of shop-houses are now largely empty — home only to construction workers, the occasional property showroom and, on Fridays, the faithful heading to prayer at the island’s mosque. Land reclamation underway at the Melaka Gateway in the Strait of Malacca. Photo by Kate Mayberry. But the on-again, off-again project got a boost in September with the decision to push ahead with the RM43 billion ($9.64 billion) Melaka Gateway scheme, a Chinese-backed development that will see the creation of three more artificial islands. Targeted for completion in 2025, the project has the support of the country’s two governments. Malaysia sees the development as a way to create thousands of jobs and lure more tourists to Melaka, while China envisages it as a key link in its “One Belt, One Road” trade infrastructure initiative. Melaka’s Kristang people, however, fear it will be a catastrophe. 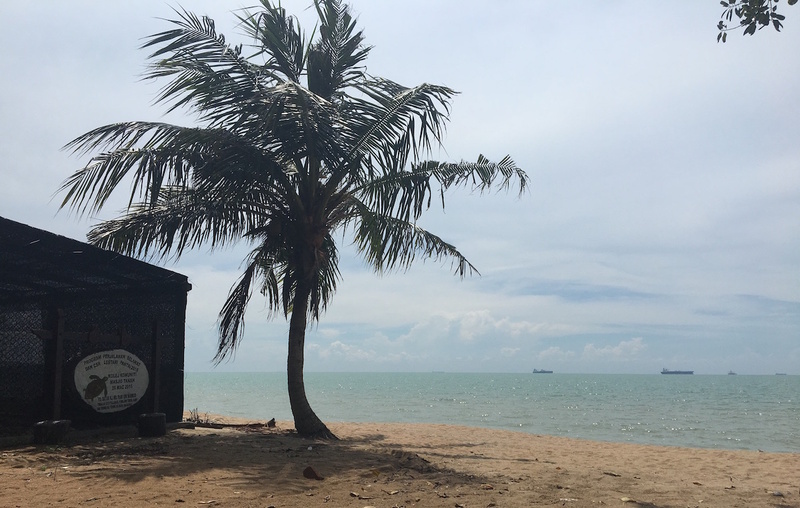 The community of seafarers put down roots in Melaka more than 500 years ago after the Portuguese seized the port from the local sultan and married local women, but they say successive waves of reclamation have isolated them from the coast that is central to their way of life. Fishing boats at the Portuguese Settlement. Photo by Kate Mayberry. The community of just over 2,000 people mostly lives in what’s known as the Portuguese Settlement, an area that’s popular with tourists who come to eat seafood in the evening, but where parts of the seafront have already been reclaimed. Only about 20 percent of the Kristang are now full-time fishermen. The fishermen have to go further out to sea if they want to get a decent catch, and the days of pottering along the shore to pick up a few fish for dinner are long gone. The retreating tide leaves their modest fishing boats aground on a bed of pungent mud and rubbish. Community leaders say the reclamation has violated the guidelines set out in the original EIA, skirting recommendations to maintain a water channel of at least 750 meters between the settlement and any reclaimed land. The Kristang estimate the channel has shrunk to just 200 metres and worry the Pulau Melaka project will make the situation worse. “If our waterway is polluted, clogged up and dead, what does that do to us?” said Michael Singho, President of the Malacca Portuguese-Eurasian Association. A nest at Padang Kemunting turtle hatchery. Photo by Kate Mayberry. In Padang Kemunting, peak nesting season for the hawksbill ended in September, but the rangers who patrol the beach are still discovering eggs, usually buried in the sand beneath the bushes that hug the shore. Each nest, usually made up of about 120 eggs, is brought to the hatchery, which is operated by Malaysia’s Department of Fisheries. The area may soon be declared a turtle sanctuary, the state government said in November. 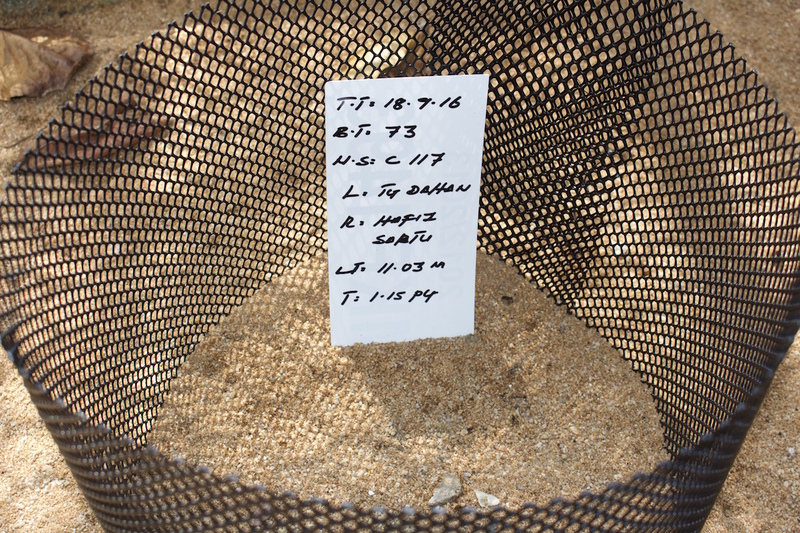 Each nest is placed in a specially designed shelter on the beach – shaded to keep off the worst of the sun and surrounded with netting – and tagged with the number of eggs in each nest and the date of its discovery. It generally takes between 40 and 60 days for the eggs to hatch, with the temperature determining the gender of the hatchling. The beach where each turtle comes into the world is the same beach where the females will return to lay their eggs. “They are linked to the beach,” said Lau. “it’s like they’re programmed to come back”. 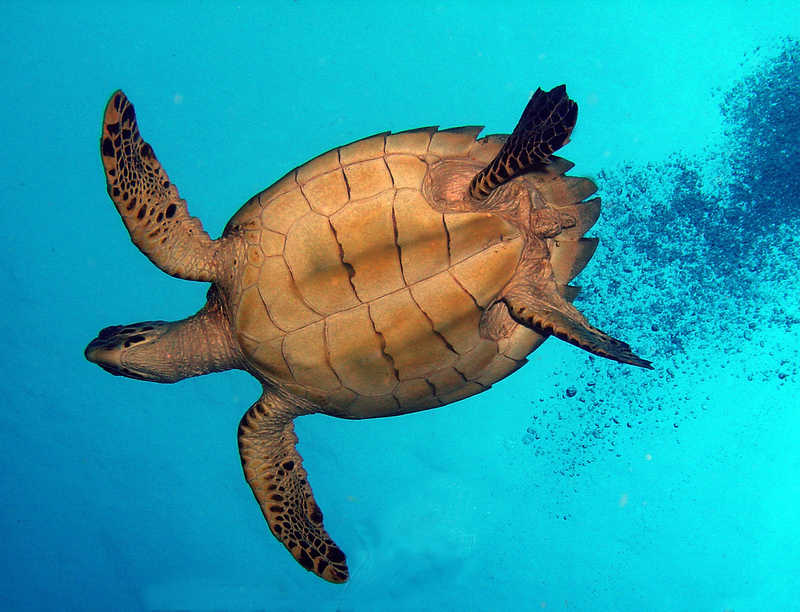 Named for its bird-like beak, and renowned for the beauty of its shell, the hawksbill takes between 20 and 40 years to reach maturity and each female will reproduce about every two years. For every 1,000 hatchlings just one will survive. The Critically Endangered Hawkbill Turtle is renowned for the beauty of its shell. Photo by Caroline S. Rogers, courtesy of NOAA. Satellite data gleaned from the movements of 15 Hawksbills the WWF has managed to fit with tracking devices shows that after laying their eggs, the turtles swim south to the Riau Islands of Indonesia and the southern islands of Singapore, where they feed on the sponges of the area’s coral reefs. Singapore is not averse to reclamation itself – the city state’s land area is now 24 percent bigger than it was at independence in 1965. But after years of policies that appeared to value development over the habitat protection, marine conservation has become increasingly important. All major development projects are required to provide detailed studies to minimize habitat loss and a real-time monitoring system detects problems almost immediately. It was partly Singapore’s concern about the environmental impact of Malaysia’s biggest ever reclamation project – the RM600 billion ($134 billion) Forest City development creating four artificial islands in the narrow waterway between the two countries – that led to a seven-month halt in construction, a detailed EIA and the developer promising to spend millions to preserve important sea-grass meadows. In Melaka, meanwhile, the scale models in the master developer’s showroom, reveal the extent of its ambitions for Melaka Gateway. 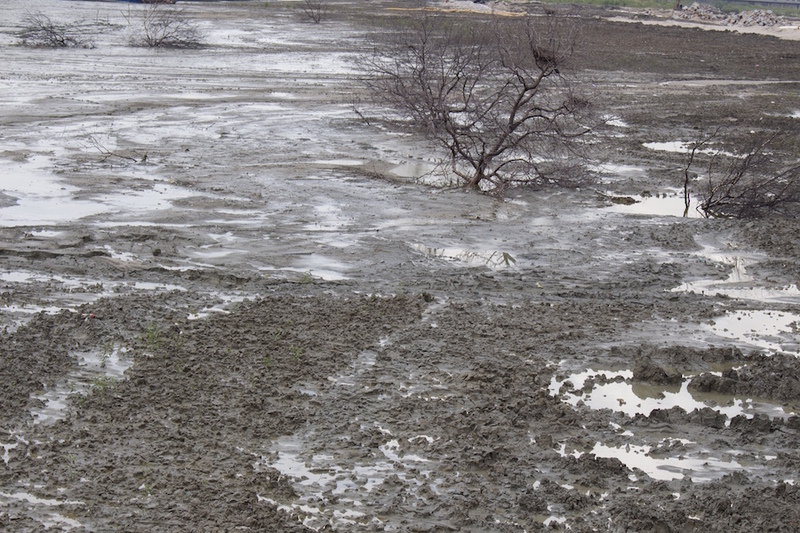 Mud built up between Pulau Melaka and the mainland. Photo by Kate Mayberry. Outside, beneath the bridge that connects Pulau Melaka to the mainland, the waterway is already silted up with mud as the reclamation stymies the movement of water. KAJ Development, which is leading the Melaka Gateway project, declined to discuss its plans on the phone, and did not respond to emailed questions relating to the environmental impact of the scheme. Padang Kemunting may seem a world away from the city, but it is not only at risk from the environmental changes wrought by reclamation work further south. It now faces the prospect of development on its doorstep; construction that could also affect the rare painted terrapins (Callagur borneonensis) that live in the surrounding river estuary and are also thought to nest along the coast. 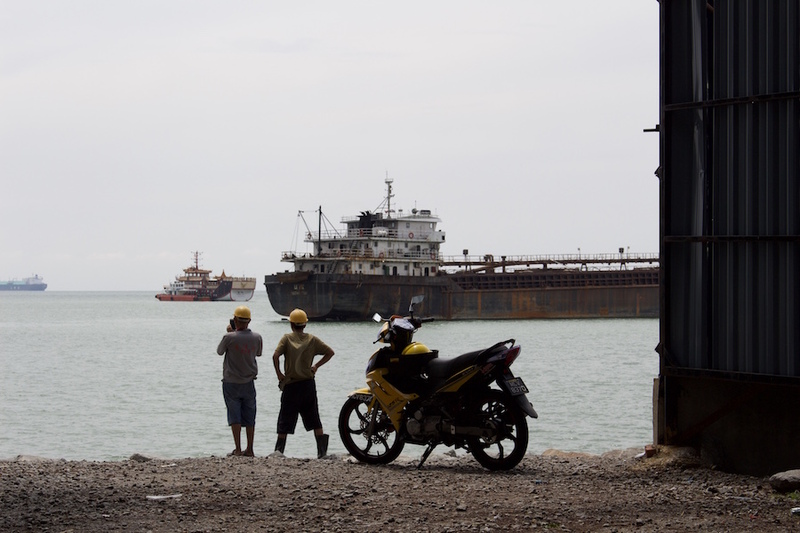 Workers take a break on Pulau Melaka. Photo by Kate Mayberry. A detailed EIA completed at the end of June found 43 percent of local residents were opposed to KLIP because of concerns about environmental degradation and its impact on the area’s small fishing community. The report noted a major risk to the painted terrapins – suggesting a number of mitigation measures during construction, and advising the developer to fund a terrapin research program, and the state government to develop a species’ conservation plan to preserve the terrapin’s habitat.